You are here: Home » Rob's Blog » What bad economy? Muscle cars still sell like hotcakes! What bad economy? Muscle cars still sell like hotcakes! Now that the first round of January 2010 auctions are behind us it’s time to take a guess at what 2010 will hold for the world of classic muscle cars……and my guess is that it’s going to be a great year! It’s been said that regardless of what happens in the economy, toys will always sell (like airplanes, yachts, and apparently muscle cars)! 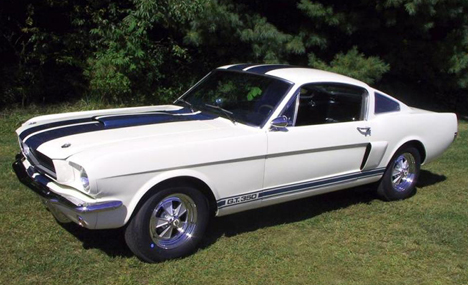 Good economy or not, a Shelby GT350 will always sell well. Image courtesy themustangnews.com. That’s right – muscle cars own 70% of the top 10 cars sold! If you dismiss the fact that an airplane was on this list (and no, it wasn’t a “muscle airplane”), that means that 7 of the top 9 cars were pure American muscle, and I think that I know why that’s the case. Without question, muscle cars are the hottest segment in the collector car industry right now, and some quick math will show you that the young boys that couldn’t afford these cars when they were new are now in their mid 50’s to early 60’s…..and they have some money to spend. They’re going after that dream they always wanted to fulfill! It’d be like asking out your wife again for the first time – only you’re 58 and she’s 18! Actually, that comparison could lead us down a dangerous road. Moving on. In the industry of collector cars there appears to be a consistent trend in that the vintage of hot collector cars is generally about 40 years old……but does that mean that the reign of muscle cars will someday end? Maybe, but I don’t think so. Keep reading. For whatever reason, 1960’s and 70’s era muscle cars don’t appear to age at all. Model T’s look like old cars. Packard’s look like old cars. Desoto’s look like old cars. Even a ’57 Chevy looks older……but a ’69 GTO doesn’t! Kids today flock to these style of cars just as much as the older crowd does. There is a BIG reason that the 2010 Mustang, Challenger, and Camaro have some familiar lines, and it’s no coincidence that the fast car in the latest block buster movie was made in 1967, not 2007. The aftermarket has never been hotter than it is right now creating parts to make old muscle cars just as fast – and comfortable – as new ones….but without giving up the style. Crate engines, brakes, suspension, R-134 air-conditioning, overdrive paddle-shifted automatic transmissions…..it’s all there, and people are buying it up like crazy. Many people have wondered how quickly the world of combustion engine cars would come to an end if in the next 10 years we moved from fossil fuels to something else….but I’m guessing that where there’s a will, there’s a way. Someone, somewhere will come up with a way to run a big block Ford on cow manure, if that’s what it takes. I guarantee it. Here’s to a bright future….and let’s hope that it’s cow manure free under the hood.